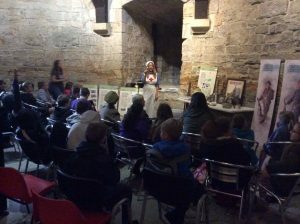 As part of the World War One commemoration project, 6 year students from Ysgol MaesGlas, Ysgol Maes y Felin and St. Winefride’s have recently visited the regimental museum of the 5th battalion Royal Welch Fusiliers at Caernarfon Castle. A key part of the project involves the school children researching and writing up individual citations for all 54 soldiers from Holywell and Greenfield who died in battle during the war. Most of these soldiers joined the 5th battalion. Their work will be presented to everyone at a commemoration event at the Holywell Roll of Honour on 11th November. The photographs show children from Maes y Felin being show items and artefacts used by soldiers – including what they wore and carried, and what they survived on, and was presented by Lorraine, dressed up as. World War 1 nurse. Can you spot the soldier in the audience? All the children were very enthusiastic and learnt so much from the demonstrations and visiting the museum. The visits were funded by monies received from Heritage Lottery for this project.